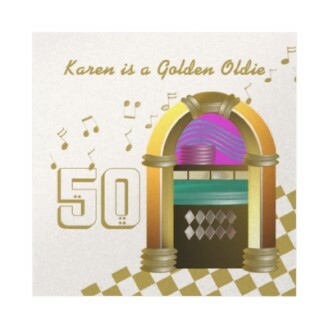 The Oldies but Goodies party theme is great for birthday parties of "older" individuals, music themed parties, and retirement parties. This party plan comes complete with invitations, decorations, food, music, game, and gift ideas. 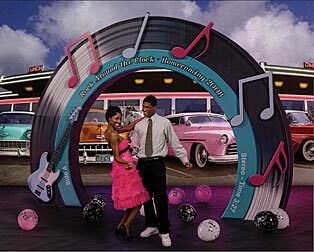 For the party invitation, anything with a Jukebox or Vinyl Records would be appropriate, like the invitation shown above. For a large collection of suitable invitations, click here. BUY This 50's Record Arch Decoration. You can have so much fun with decoration for the Oldies-but-Goodies Themed party. You can get something like what is shown above or the old 50's Dinner shown below. 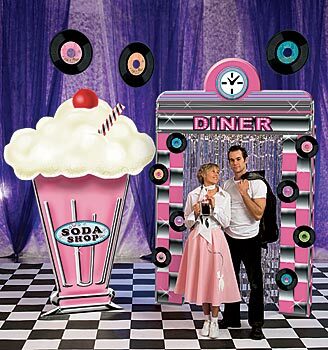 BUY this 50's Diner Standee. The menu for this theme would be quite simple. Something like burgers and fries with ice cream floats. Depending on the type of party you are throwing, you'd have a birthday cake or a retirement cake etc. The music for this party would be all of your favorite Oldies but Goodies. Poodle skirts and bobby socks for the girls and jeans, T-shirts, and slicked back hair for all of the Fonzie want-a-bees. Be prepared to dance the night away. Players may just break into a little song as they compete in this game! The 'old timers' and nostalgia buffs will probably remember the words to "It's My Party"... but will they remember who sang it? Beautiful marriage of the vintage with high-tech. Nice gift to bring back the happy memories of the "good old days".